This document describes SCXML, or the "State Chart extensible Markup Language". SCXML provides a generic state-machine based execution environment based on CCXML and Harel State Tables. This document is the second Public Working Draft of SCXML for review by W3C Members and other interested parties, and has been developed by the Voice Browser Working Group (W3C Members Only) as part of the W3C Voice Browser Activity. This draft differs from the previous primarily in that it adds a data model and fully specifies the syntax of the language. Comments for this specification are welcomed to www-voice@w3.org (archives). The terms base URI and relative URI are used in this specification as they are defined in [IETF RFC 2396]. As a dialog control language invoking speech recognition, DTMF recognition, speech synthesis, audio record, and audio playback services. As a multimodal control language in the MultiModal Interaction framework [W3C MMI], combining VoiceXML 3.0 dialogs with dialogs in other modalities including keyboard and mouse, ink, vision, haptics, etc. It may also control combined modalities such as lipreading (combined speech recognition and vision) speech input with keyboard as fallback, and multiple keyboards for multi-user editing. As an extended call center managment language, combining CCXML call control functionality with computer-telephony integration for call centers that integrate telephone calls with computer screen pops, as well as other types of message exchange such as chats, instant messaging, etc. SCXML combines concepts from CCXML and Harel State Tables. CCXML [W3C CCXML 1.0] is an event-based state machine language designed to support call control features in Voice Applications (specifically including VoiceXML but not limited to it). The CCXML 1.0 specification defines both a state machine and event handing syntax and a standardized set of call control elements. Harel State Tables are a state machine notation that was developed by the mathematician David Harel [Harel and Politi] and is included in UML [UML 2.0]. They offer a clean and well-thought out semantics for sophisticated constructs such as a parallel states. They have been defined as a graphical specification language, however, and hence do not have an XML representation. The goal of this document is to combine Harel semantics with an XML syntax that is a logical extension of CCXML's state and event notation. For an overview of the UML notation and a brief outline of SCXML's semantics, see G An Overview of UML Notation and SCXML Semantics, below. For concreteness sake, we use ECMAScript as the language for data elements, but as noted in Section 5 Data Model below, we have not yet chosen a data access language. In any case the complete language definition will permit multiple data access languages to be used. The top-level root element, which carries version information etc. initialstate true ID none Valid state ID The id of the initial state for the document. The statemachine will transition to this state as the last step in document initialization. <state> A top-level state in the state machine. Occurs one or more times. See 3.2 <state> for details. <datamodel> Optional specification of a datamodel. See 5 Data Model for details. Holds the representation of a state. ID false ID none Valid state ID Identifier for this state. If present it must be unique within the document. src false URI none The URI of a document containing a valid state specification URI of a file containing the definition of this state. If it is present, no children are allowed. final False Boolean False Boolean Boolean property indicating whether this is a final state or not. Final states may not have substates or outgoing transitions. When a final state is entered, a completion event "parentID.done" is generated, where "parentID" is the <id> of this state's parent state. task False Boolean False Boolean If true the state is considered to be a task for reporting purposes and entry and exit will be logged automatically. The logging shall include at least the state's ID and the status upon exit. The legal status values are 'success' and 'failure' where 'success' indicates that the task ran to completion, while 'failure' indicates that the task did not reach completion. By default, the task will be considered to have completed successfully if the state reaches a final substate while any other exit will be considered failure. Implementations are encouraged to include more detailed information in addition to status, such as reason for failure, etc. This attribute may occur only on complex states, i.e., those with <state> or <parallel> children. <state> Defines a sequential substate of the parent state. May occur 0 or more times. Incompatible with the <parallel> property. <history> A child which represents the descendant state that the parent state was in the last time the system transitioned from the parent. A transition with this state as its target is in fact a transition to one of the other descendant states of the parent. May occur 0 or more times. See 4.2 <history>. Transitions between states are triggered by events and conditionalized via guard-conditions. The optional attribute "target" specifies the destination of the transition, which may be a <state> or a <parallel> region. If the "target" on a <transition> is omitted, then taking the transition has the effect of leaving the machine in the same state after invoking any executable content that is included in the transition. Such a transition is equivalent to an 'event' handler in Harel State Table notation. Note that this is different from a <transition> whose "target" is its source state. In the latter case, the state is exited and reentered, triggering execution of its <onentry> and <onexit> executable content. Any executable content contained in a transition is executed after the <onexit> handlers of the source state and before the <onentry> handlers of the target state. Within both the 'cond' attribute of the transition and the executable content, the special variable '_eventdata' may be used to access data contained within the triggering event. event false String none Any event name. The wildcard '*' is permitted. The event trigger for this transition. The transition will be taken only when the event is generated. See G An Overview of UML Notation and SCXML Semantics for details on how transitions are selected. cond false Data language expression none Any data language expression that evaluates to a boolean. Guard condition for this transition. If it is present, the transition is taken only if the guard condition evaluates to true. See 7 Boolean Expressions for details. target false state or parallel region ID none Whitespace separated list of state IDs in the current state machine. If multiple states are specified all must be descendants of the same <parallel> element. The identifier(s) of the state or parallel region to transition to. If a transition has both <event> and <cond> conditions, it will be taken only if an event is raised that matches the <event> pattern and the <cond> condition evaluates to true. (See G.5 Concurrency And Event Queues for the case where multiple transitions match a given event or condition.) If the <event> clause is missing, the transition is taken whenever the <cond> evaluates to true. If the <cond> clause is also empty, the transition is taken as soon as the state is entered. Note that the data model can be changed only by the execution of <invoke> or executable content. Therefore transitions with empty <event> conditions need be checked only 1) upon arrival into a state, after the completion of all <onentry> handlers and 2) after an event has been processed (since it may have triggered executable content which could have updated the data model). A wrapper element that encapsulates parallel state machines. The <parallel> element has <onenter> and <onexit> properties analogous to <state>. In addition, the <parallel> element holds a set of <state> elements that execute in parallel and join at the <onexit> handler of <parallel> element. In particular, when all of the parallel substates reach a final state, a completion event "ID.done" is generated, where "ID" is the <id> of the <parallel> element. Either the <parallel> element or one of its ancestors can trigger a transition off this event, at which time the <onexit> handler of the element will be executed. For the <parallel> element to be useful, each of its <state> substates must itself be a complex state, i.e., one with either <state> or <parallel> children. When the state machine enters the parent <parallel> element, it simultaneously enters each <child> state. Transitions wihthin the individual <child> elements operate normally, but there may not be transitions between the <child> elements since that would violate the semantics of parallelism. However any of the <child> elements may take a transition outside the <parallel> element. When this happens, the <parallel> element and all of its <child> elements are exited and the corresponding <onexit> handlers are executed. The handlers for the <child> elements execute first, in no determinate order, followed by that for the parent <parallel> element, followed by an <action> expression in the <transition> element, and then the <onentry> handlers in the "target" state. id false ID none Valid state ID Indicates the name of the parallel region. src false URI none The URI of a document containing a valid parallel region specification URI of a file containing the definition of this parallel region. If it is present, no children are allowed. task False Boolean false Boolean If true the parallel is considered to be a task for reporting purposes and entry and exit will be logged automatically. The legal status values are 'success' and 'failure' where 'success' indicates that the task ran to completion, while 'failure' indicates that the task did not reach completion. By default, the task will be considered to have completed successfully if the state reaches a final substate while any other exit will be considered failure. Implementations are encouraged to include more detailed information in addition to status, such as reason for failure, etc. <state> Defines a parallel substate region. Must occur 1 or more times. <datamodel> Optional specification of a data model. See 5 Data Model for details. The following elements are called 'pseudo-states' because they do not have the full properties of states (for example they lack <onentry> and <onexit> handlers) and do not map to states in the underlying semantics of the language. However, they can be used like states in many places. In particular, they can often be the "target" of <transition>. They are a notational shorthand allowing the simple statement of some sophisticated control constructs. This element represents the default initial state for a complex state with sequential substates. Suppose <state> S1 has child states S11, S12, and S13. If the system is in S1, it must also be in one (and only one) of S11, S12, or S13. A <transition> in a distinct <state>S2 may take S11, S12, or S13 as its "target", but it may also simply specify the parent S1. In that case, the <initial> child of S1 specifies which of S11, S12, or S13 the system should transition to. ID false ID none Valid state ID Identifier for this pseudo-state. If present it must be unique within the document. <transition> A conditionless transition (i.e., one without a <cond> or <event> property). Such a transition is always enabled and will be taken as soon as the state is entered. The "target" of the transition must be a descendant of the <initial> element's parent <state>. If <state>S1 has an <initial>child with a <transition> with "target" S12, there is no semantic difference between a the following three transitions: a) one that takes S1 as its "target" b) one that takes S1's <initial> child as a "target" c) one that takes S12 as its "target". The result in all three cases is that the system enters both S1 and S12 as an atomic action, executing the <onentry> handlers of first S1 and then S12. The <history> pseudo-state allows for 'pause and resume' control flow. Whenever a complex <state> is exited, its <history> pseudo-state, if present, records the state configuration at exit. Later a <transition> taking the <history> state as its "target" allows the <state> to pick up where it left off. type false string shallow "deep" or "shallow" If the value is 'shallow' then this state records only the immediate children of the parent <state>. In this case a <transition> with the history pseudo-state as its "target" will end up in the immediate child state that the parent was in the last time it was exited. On the other hand, if this attribute is set to 'deep', the history pseudo-state will remember nested states. In this case a <transition> with the history pseudo-state as its "target" will end up in the mostly deeply nested descendant <state> the parent was in the last time it was exited. snapshot false Data model location none one or more data model expressions denoting nodes in the data model. An optional attribute specifying locations in the datamodel that are to be rolled back when the history state is entered. See Section 5.4 Rolling Back the Data Model for details. <transition> A conditionless transition (i.e., one without a <cond> or <event> property). Such a transition is always enabled and may be taken as soon as the state is entered. This <transition> represents the default history state and indicates the <state> to transition to if the parent <state> has never been entered before. if <type> is 'shallow', then the "target" of this <transition> must be an immediate child of the parent <state>. Otherwise it can be any descendant <state>. The <join> pseudo-state provides barrier logic allowing the synchronization of defined threads of control. All incoming transitions must be unconditional. For a discussion of join's semantics see G An Overview of UML Notation and SCXML Semantics. <transition>. May occur one or more times. May not contain an <event>. At least one instance must not contain <cond> guard condition. These restrictions ensure that at least one transition is enabled whenever the join is reached. <invoke> and its child <finalize> are useful in states that model the behavior of an external service. The <invoke> tag is executed immediately after the state's <onenter> tags and sends an event invoking the external service. (<invoke> can thus be considered to be a syntactically distinguished <onenter> tag.) The <param> element may be used to pass data to the service. Any events that are received by the state machine from the invoked component during the invocation are preprocessed by the <finalize> handler before transitions are selected. The <finalize> code is used to normalize the form of the returned data and to update the data model before the transitions' <event> and <cond> clauses are invoked. The external service may generate multiple events while it is processing, but it must generate a special 'Done' event (syntax TBD) once it has finished processing. It may not generate any other events afterwards. If the the invoking state machine takes a transition out of the state containing the <invoke> before it receives the 'Done' event, it must automatically send a 'Cancel' event to the invoked component to notify it that it may stop its processing. The 'Cancel' event will be sent as if it were the final <onexit> handler in the invoking state. The invoked component must respond to the 'Cancel' event with a 'CancelResponse' event (syntax of both events TBD). The invoking state machine will take its transition without waiting for the CancelResponse event, which will be processed like any other external event. Note that the <invoke> element may be used to invoke an external SCXML interpreter to execute a different state machine. In this case, the external state machine acts as a set of substates of the invoking state. The behavior is thus similar to a complex state defined with <state> child elements. The most important difference is that in the <invoke> case, the external state machine does not share context with the invoking machine. In particular, the invoked machine cannot access any variables declared in the invoking machine and data can be shared only by being explicitly passed via the <param> element. Furthermore, IDs need not be distinct across the two machines (though they must, of course, be distinct within each machine.) The <invoke> tag thus provides a means of well-encapsulated code reuse. For the niceties of the semantics of <invoke>, consider the case when parallel states invoke the same external service concurrently. In this case, two separate instances of the external service will be started. They can be distingused by the states' "id" which is passed with the invocation. Similarly, the "id" contained in the events returned from the external services can be used to determine which events are responses to which invocation. Each event that is returned will be processed only by the <finalize> in the state that invoked it, but that the event is then processed like any other event that the state machine receives. The finalize code can thus be thought of as a preprocessing stage that applies before the event is added to the event queue. Note that the event will be passed to all parallel states simultaneously to check for transitions. If the application developer wishes to ensure that the event is processed only by the state that issued the <invoke>, he should condition its transitions on the event's <id> property. targettype true string 'scxml' 'scxml', 'vxml', 'ccxml', plus other platform-specific values. A string specifying the type of the external service. Default value is 'scxml'. 'vxml'indicates a VoiceXML 2.x interpreter, while 'ccxml'indicates a CCXML 1.0 interpreter. Platforms may provide additional values. src false URI none Any URI A URL that will be passed to the external service when it is invoked. If "targettype" is one of the predefined types, the document at the URI will contain the corresponding markup to execute (i.e., an SCXML, VoiceXML, or CCXML document). In other cases, the content of the document will depend on the external service. srcexpr false Expression None Any expression evaluating to valid URI. A data model expression that will be evaluated at the time that invoke is executed to produce the URI to pass to the external service. Exactly one of "src" and "srcexpr" must be specified. <param>. Optional child element containing data to be passed to the external service. May occur 0 or more times. See 4.5 <param>. <finalize>. Optional element containing executable content to massage the data returned from the invoked component. May occur 0 or 1 times. See 4.6 <finalize> for details. <invoke> is incompatible with the <state> and <parallel> elements. It may thus occur only in atomic states, namely those which do not have substates. name true Data model expression none Valid data model path expression The name of the parameter. It will be passed unmodified to the external service. It need not specify a node in the surrounding data model. expr false Data model expression none Valid data model expression An optional expression in the data model language which evaluates to an XML tree. The tree may be part of the data model of the surrounding state machine or may be specified in-line. Normal data model scoping rules apply as specified in 5 Data Model . If the <expr> attribute is missing, the <name> attribute will be taken as a data model expression referring to a location within the data model and the corresponding data model tree will be passed to the invoked component. If the <name> attribute does not refer to a location in the data model, an error will be generated. Normal data model access and scoping rules apply as specified in 5 Data Model . <finalize>'s children consist of executable content. The content will be invoked on any event that the external service returns after <invoke> has been executed. In the case of parallel states, only the finalize code in the original invoking state will be executed (i.e., the state whose <id> matches the id in the event.) Within the executable content, the special variable '_eventdata' may be used to refer to the data contained in the event which is being finalized. If no executable content is specified, a default canonicalization handler will be invoked which will update the data model with any return values corresponding to <param> elements with missing <expr> attributes. Thus the effect of a <param> element with an empty <expr> attribute coupled with an empty <finalize> element is first to send all or part of the data model to the invoked component and then to update the that part of the state machine's data model with the returned values. Note that the automatic update does not take place if the <finalize> element is absent as opposed to empty. The purpose of the executable content is to normalize the format of data and update the data model before transitions are selected. <finalize> code may only massage data. It may not raise events or invoke external actions. N.B. This section is provisional and may end up being part of a separate specification. In either case, the definition of the data model may change significantly in the future. Note furthermore that we have not yet specified the language to be used to access the data model. To provide a uniform method of access to both local and remote data, we introduce a <datamodel> tag which encapsulates any number of <data> elements. Each such element defines a single data element whose value is an XML tree. The XML tree may be fetched from an external source or specified in-line. Note that atomic variable values are simply degenerate XML trees consisting of a single leaf, so that the <data> element subsumes the <var> element of CCXML. Data accessed via the <data> tag is local to the SCXML interpreter and not shared with any external resource. However, the local data model, or parts of it, may be sent to an external resource via the <send> tag. (See 6.2.1 <send>.) Existing data values may be modified with the <assign> tag. (See 6.1.1 <assign>). Logically, there is a single globally visible data model for the entire state machine. As an authoring convenience, however, we allow <datamodel> as a child of any <state>, thus allowing parts of the data model to be distributed throughout the document closer to the locations where the data will be accessed. However, all instances of the <data> tag are created and initialized when the state machine is instantiated and may be accessed from any state at any time. As a further authoring convenience, ambiguous data references will be resolved by standard lexical scoping rules. For example, suppose <state> S has a child S1, S1 has children S11 and S12, and that both S1 and S11 contain <data> elements defining a data tree called 'foo'. References to 'foo' in both S1 and S12 will refer to S1's definition, while a reference inside S11 will refer to S11's definition. A reference to 'foo' in root state S would result in an error because no instance of 'foo' is declared in any surrounding scope. To avoid such errors and override the default scoping rules, the <data> element's name may be prefixed with the ID of the state in which it is declared. Thus in any of the above states, 'S1.foo' will unambiguously refer to the instance of 'foo' defined in S1, while 'S11.foo' will refer to the instance defined in S11. <data> elements defined at the top level under the <scxml> tag may be unambiguously designated by using the '_dm.' prefix. <data> Occurs 0 or more times. Each instance defines a named XML data tree. Trees are created when the document is loaded. name true string none Any valid string The name of the data item. It must be unique within the <state> but need not be unique within the document. src false URI none Any URI referencing a valid XML tree Gives the location from which the data XML tree should be downloaded. If present, the <data> element may not have children or an <expr> attribute. expr false Expression none Any valid data model expression Evaluates to the provide the value of the data item. If present, the <data> element may not have children or a <src> attribute. If <scr> and <expr> are not present, the children of the <data>element should form one or more an XML trees, which represent the value of the element. In addition to the <src> attribute and in-line child elements, values for the top-level <data> elements can be provided by the environment at instantiation time. The exact mechanism for this is implementation dependent, but values provided at instantiation time override those contained in the <scxml> tag, whether they are specified in-line or via the <src> attribute. The data model can be snapshotted and then rolled back using <history> pseudo-states. Each history state has an optional <snapshot>attribute, whose value is one or more path expressions designating locations in the data model. When the history state's parent state is exited, the history state will take and store a snapshot of those locations in the data model. The snapshot will be taken after the parent state's <onexit> handlers have executed, but before the execution of any executable content in the parent's ancestor states or in the transition itself. When the history state is the target of a transition, the stored values will be restored right before the history state's parent state is entered (but after the entry into any of the parent state's ancestors, including the execution of their <onentry> handlers.) Note that this feature can be used in conjunction with multiple history states to control when both the snapshot and the rollback occur in the case of nested states. 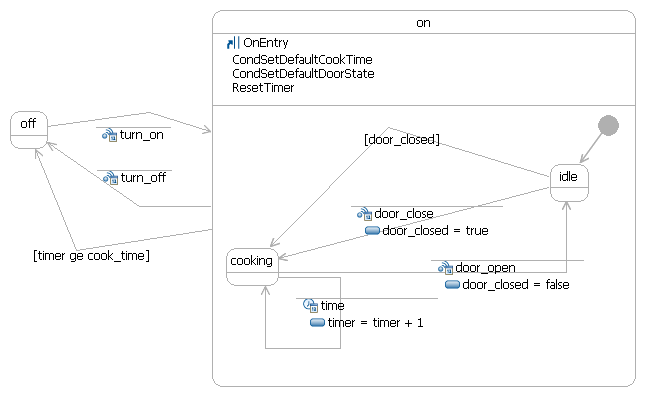 Executable content consists of actions that are performed as part of taking transitions and entering and leaving states (<onentry> and <onexit>, etc.) In general, such content must be able to modify the data model, raise events, and invoke functionality in the underlying platform. On the other hand, executable content may not cause transitions or any form of change of state, except indirectly, by raising events that are then caught by transitions. The content presented here is closely based on that in CCXML. This is partly for reasons of backward compatibility, but also because CCXML's executable content is quite flexible and has proved is usefulness in a variety of applications. Platforms are free to provide additional executable content corresponding to special features of their implementations. It is important to remember, however, that SCXML treats executable content as a single blocking atomic operation and that no events are processed until all executable content has completed. For example, upon entering a state, the SCXML processor will not process any events or take any transitions until all <onentry> handlers have finished. Thus all executable content, including platform-specific extensions, should complete quickly under all circumstances. A general method for implementing extensions using the <send> tag is presented in 6.5 Custom Action Elements below. The <assign> tag may be used to modify the data model. location true path expression none Any valid path expression denoting a location in the data model The location in the data model into which to insert the new value. Standard lexical scoping rules apply. It is not required to assign to the root of a tree (the <name> value in a <data> tag), since the path expression can reach down into the tree to assign a new value to an internal node. src false URI none Any URI referencing a valid XML tree The location from which the new value should be read. Incompatible with expr. expr false data model language expression none Any expression evaluating to a valid XML tree An expression returning the value to be assigned. Incompatible with src. If <scr> and <expr> are not present, the children of the <assign>element should form one or more an XML trees, which represent the value of the element. SCXML events carry data and executable content needs to be able to access that data in order to update the data model. The special variable '_eventdata' can be used within executable content to access the data in the current event. In the executable content of <onentry>, <onexit> and <transition> elements, the 'current event' is defined to be the event that triggered the transition. If there is no such event or the event contains no data, _eventdata is undefined. In the 'cond' attribute of <transition>, the current event is the one that is currently being matched against the transition. In all other locations, '_eventdata' is undefined. Variables local to a specific block of executable content may be declared using the <var> element and are initialized with the results of evaluating the optional <expr> attribute as an expression. If the <expr> attribute is not present in the <var> declaration, the variable is initialized to <undefined>. The values of variables may be subsequently changed with <assign>. The implementation MUST evaluate the expression contained in the <expr> attribute of <assign>, and assign the results to the variable referenced in the <name> attribute. N.B. <var> is included for reasons of backward compatibility with CCXML. It may be removed as we refine the data model. For the most part, <data> offers a superset of the capabilties of <var>. For example, <var> value must be atomic, while <data> may hold a general XML tree as a value. The main differences between <var> and <data> are: 1) <var> can occur anywhere in executable content while <data> can occur only inside the <datamodel> tag 2) <var> is re-initialized each time it is executed, while <data> is initialized when the document is loaded 3) The value of <var> is accessible only within the block of executable content in which it occurs, while the values of <data> are global. New applications should use the <data> tag wherever possible. name true Variable name none Valid Variable name Indicates the name of the variable. expr false Expression none Valid Expression Indicates the new value of the variable. This is the initial value. <script> encloses computations written in the ECMAScript Compact Profile [ECMA327] scripting language. The ECMAScript Compact Profile is a strict subset of the third edition of ECMA-262 [ECMASCRIPT]. It has been designed to meet the needs of resource-constrained environments. Special attention has been paid to constraining ECMAScript features that require proportionately large amounts of system memory, and continuous or proportionately large amounts of processing power. In particular, it is designed to facilitate prior compilation for execution in a lightweight environment. For specific details on what ECMAScript functions are not supported please take a look at ECMA-327 specification. An implementation must support the ECMAScript Compact Profile and MAY support the full ECMA-262 ECMAScript specification. The implementation must evaluate <script> in executable content as it is processed. The ECMAScript contained within the <script> can declare variables with the ECMAScript var statement. Variables declared in this manner are declared in the scope of the surrounding executable content element. They are known from the point of declaration to the end of that element. If the implementation is unable to run the script referenced it must throw an error.semantic event. N.B. <script> is included for reasons of backward compatability with CCXML. It may be removed in future versions of this document. The children of <script> must form a valid EXMAScript expression. <send> is used to send events and data to external systems, including external SCXML Interpreters, or to raise events in the current SCXML session. The target of <send> is specified using the "target" and "targettype" attributes. These attributes control how the platform should dispatch the event to its final destination. The "target" attribute specifies the unique identifier of the event target that the system should send the event to. This can be the session ID of another SCXML session. In other cases the value of this attribute will depend on the type of the target. (For example a SIP URL for SIP-INFO messages or a HTTP URL for Web Services). If no "target" attribute is specified the default target is the current SCXML session. If the value of the "target" attribute is not supported, invalid or unreachable by the platform, the system will throw a <error.send.targetunavailable> event. The "targettype" attribute describes the type of the event target and is used in conjunction with the "target" attribute to determine how to connect to the target. The default value of this attribute is 'scxml'. If the event "targettype" specified is not supported, the platform will throw a <error.send.targettypeinvalid> event. Platforms may support other target, for example: SIP or basic HTTP GET. The <event> attribute specifies an expression that returns the name of the event. The <namelist> attribute specifies a space separated list of data model locations to be included with the message. If an explicit namespace is provided as in the xmlns attribute of the <send>, this namespace can be used to validate the content of the <send>. A namespace specified on a <send> applies only to the attributes and content of the <send>. Multiple namespaces may be included in the <send> to associate message content with more than one namespace. When an explicit namespace is specified for the <send>, the content of the <send> is parsed but can be ignored by the sending SCXML interpreter until the <send> is executed. XML namespace identifiers contained in the <send> must be preserved and it is the responsibility of the platform to parse the incoming message and remove the namespace prefix, if required by the <send> target. The sending SCXML Interpreter must not alter the content of the <send> and send all the data contained within the message to the destination specified in the target attribute of <send>. When <send> is used with inline XML content, and the target is a SCXML session, the mapping of that XML content to event object properties is implementation-specific, and outside the scope of this specification. When a message is successfully sent to the target, the platform will raise a <send.successful> event. Note that this does not mean that the target processed the message successfully. It is up to the target to generate events specific to the message. These events are application specific. If the send request fails, an <error.send.failed> event will be raised. event false This attribute may not be specified in conjunction with inline content Expression none An expression which returns a character string that indicates the type of event being generated. The event type may include alphanumeric characters and the "." (dot) character. The first character may not be a dot or a digit. Event type names are case-insensitive. If neither the event attribue or in-line content is specified, an error.fetch event will be thrown. If used in conjunction with the inline content, an error.fetch will be thrown. target false Expression none A valid target URL An expression returning a unique identifier of the event target that the platform should send the event to. sendid false Left Hand Side Expression none Variable Any data model expression evaluating to a data model location. The location's value will be set to an internally generated unique string identifier to be associated with the event being sent. If this attribute is not specified, the event identifier is dropped. delay false Expression '0s' An expression which returns a character string in CSS2 [CSS2] format The character string returned is interpreted as a time interval. The send tag will return immediately, but the event is not dispatched until the delay interval elapses. Timers are useful for a wide variety of programming tasks, and can be implemented using this attribute. Note: The queue for sending events is maintained locally. Any events waiting to be sent will be purged when the session that issued this request terminates. xmlns:[YourNameSpacePrefix] false string none This returns a namespace identifying the contained message format. More than one xmlns attribute may be included. namelist false This attribute may not be specified in conjunction with inline content Var List none List of data model locations A list of zero or more data model locations to be included with the event. If used in conjunction with the inline content, an error.fetch will be thrown. hints false Expression none An expression. The data returned contains information which may be used by the implementing platform to optimize message transmission. The meaning of these hints is platform-specific. When a SCXML program uses <send> to send an event and includes a <delay> attribute, the <cancel> command will cancel the pending event, if possible. If the delay has expired and the event has already been sent, the <cancel> request will fail and an <error.notallowed> event will be delivered to the SCXML session that executed the <cancel>. The <cancel> element may be used to cancel events delivered to local or remote SCXML sessions. Compliant SCXML implementations are REQUIRED to support the cancellation of local events but may choose not to support the cancellation of remote events in which case an <error.notallowed> event should be thrown for such requests. The format of the event identifier returned by a <send> request, and specified in the <sendid> attribute of <cancel>, is implementation specific but is expected to uniquely define events across SCXML sessions. sendid true Expression none A valid event identifier An expression which returns the value of the event identifier that was received when the send command was issued. <if> is a container for conditionally executed elements. <else> and <elseif> can optionally appear within an <if> as immediate children, and serve to partition the elements within an <if>. <else> and <elseif> have no content. <else/> is a synonym for <elseif cond="true"/>. Each partition within an <if> is preceded by an element having a <cond> attribute. The initial partition is preceded by the <if> and subsequent partitions by <elseif>s (or <else>s). The first partition in document order with a <cond> that evaluates to <true> is selected. <else> always evaluate to <true>. A partition may be empty. If an <if> has no immediate <elseif> or <else> children, the full contents of the <if> will be selected when the <cond> attribute is <true>. With this definition for <else>, a valid XML [XML] document is also a valid SCXML document. cond true Expression none A valid expression An boolean expression. See 7 Boolean Expressions for details. An <elseif> partitions the content of an <if>, and provides a condition that determines the selection of the partition it begins. <elseif> can appear optionally as an immediate child of an <if>. cond true Expression none A valid expression An expression which can be evaluated to true or false. <else> is a synonym for <elseif cond="true"/>. none none else is a synonym for elseif cond="true". <log> allows an application to generate a logging or debug message which a developer can use to help in application development or post-execution analysis of application performance. The manner in which the message is displayed or logged is platform-dependent. The usage of label is platform-dependent. The use of <log> SHOULD have no other side-effects on interpretation. <log>is an empty element. label false Expression none An expression which returns a character string which may be used, for example, to indicate the purpose of the log. expr true Expression none An expression evaluating to a string to be logged. level false TBD TBD TBD This information will be logged only if the system's log level is at this level or higher. The mechanism for specifying the log level and its legal values will be specified in a future version of this document. The exact mappings between Custom Action Elements and <send> actions are to be defined in the individual Custom Action Element specifications. The In predicate allows guard condition in one state to test whether the system is also in another state. This is useful in <parallel> regions. <state> The <id> of a state. The expression returns true if the system is currently in that <state>. Events have names which are matched against the <event> attribute of transitions. These names are strings consisting of alphanumeric characters plus the character '.' which is used to segment names. The wildcard '*' will match zero or more characters of the processed event's name so that a transition with <event> attribute of 'error. *' will match 'error.send', 'error.send.failed', etc. Events optionally contain data organized into XML trees. If data is present, it must be able to be accessed via the '_eventdata' variable, as specified in 6.1.2 _eventdata. If the event does not contain data, '_eventdata' is undefined. There is a special class of error events whose names begin with 'error.'. They may be raised by the platform, as specified in this document, or under application control. They are placed in the event queue and processed like any other event, except that there is a special built-in default transition at the <scxml> level that will exit the state machine. Thus errors that are not explicitly handled are not dropped as other events are, but cause the session to terminate. In may applications, it is important for SCXML to receive events from external entities (for example those to which it contacted with <invoke> and <send>.) For the moment, the delivery of external events to SCXML is left as a platform-specific, but it may be specified in a future version of this document. In any case, external events must be placed in the event queue for processing and must obey the external interface specified above. For the most part, the set of events raised during the execution of an SCXML document is application-specific and generated under author control by use of the <send> tag. However, certain events are mandatory and generated automatically by the interpeter. In this version of the specification, in addition to error events, there is only the 'Cancel' event which is sent if the state machine leaves the containing state after executing the <invoke> tag but before receiving the 'Done' event. Note that there are also mandatory events that invoked components must return to the invoking SCXML state machine. In this version of the specification, there are two such events, namely 'Done' and 'CancelResponse'. We may well change or expand this set of mandatory events in future drafts of this specification. Furthermore, it is likely that there will be distinct profiles of SCXML for specific applications, such as the Multi-modal Interaction Framework [W3C MMI] and VoiceXML 3.0. These profiles will define extensions to the core language and will likely extend the set of mandatory events with additional events appropriate to the specific application. A number of other XML-based state machine notations have been developed, but none serves the same purpose as SCXML. XMI [UML XMI] is a notation developed for representing UML diagrams, including Harel State charts. However it is intended as a machine interchange format and is not readily authorable by humans. ebXML [OASIS ebXML] is a language for business process specification intended to support B2B e-commerce applications. It contains a state machine language that is in some ways similar to the one presented here, but its syntax and semantics are closely tied to its intended use in e-commerce. It is therefore not suitable as a general-purpose state machine language. XTND [XTND], also called XML Transition Network Definition, is a notation for simple finite state machines but lacks Harel's notions of hierarchical and parallel states and are thus not suitable for a general-purpose state machine that is semantically equivalent to Harel statecharts. The following people contributed to the development of this specification. We need to specify the full set of errors that the platform may raise. We need to specify how SCXML session IDs are created an accessed. Should we permit <parallel> as an immediate child of <sxcml>? The current draft requires an empty wrapper <state> element. Do we need <datamodel>? It has no attributes and <data> could be a direct child of <state>. Do we need a <returndata> tag separate from <send>? Do we need to allow the including state to override content in the included state? If so, the elements in question would both need to have IDs specified. How can a state with <task> set to true override the default values for success or failure? Do we want to allow this attribute to occur on atomic state? It wouldn't make much sense, but the restriction to complex states may be hard to enforce. We need to explain in more detail how <send> can be used to update external data sources - message protocols and formats, etc. We have removed the <synch> tag. We need to explain why it is no longer needed. In some applications, it is useful for a state machine to behave non-deterministically according to a probability distribution. For example, we may want to have a state S1 which transitions to S2 30% of the time and to S3 70% of the time. Such behavior can be modelled in SCXML as long as the executable content includes a random number generator. In the example below, we use ECMAScript to generate a random number between 0.0 and 1.0 in the <onentry> handler of state S1. S1 has two transitions, both triggered by E1, going to states S2 and S3. S1 takes the first transition if the variable <rand> is ≤ 0.3 but the second transition if <rand> is > 0.3. Since <rand> is evenly distributed between 0.0 and 1.0, S1 will transition to S2 30% of the time and S3 70% of the time on event E1. Note that it is important that the random number generation take place outside the <cond> clause of the transition since there are no guarantees of when or often that will be evaluated. One of the goals of the SCXML activity is to make sure that the resulting language is compatible with CCXML and that there is an easy path for CCXML scripts to be converted to SCXML without major changes to the programing model or document structure. However, the XSLT script that was included in the first draft of this document is out of date and is therefore omitted in this draft. It will be updated in a future version. <!-- Transition on to Test4. - are trying to keep it simple here. - Custom Action Elements instead of send . - element to run a v3 form. Note that the event "v3:HelloWorld.done"
- so Test6 is not exited. - is a final state. - an external file referenced by Main.scxml. 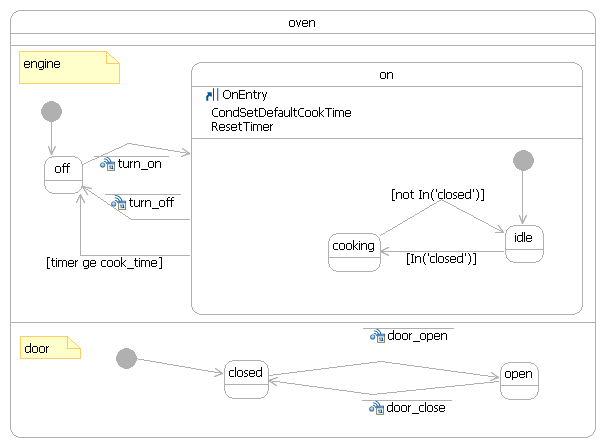 Next, we show the same microwave example, but this time implemented using <parallel>. This SCXML document demonstrates the use of Invoke and finalize. This section will outline the most salient features of SCXML semantics, as well as the corresponding UML notation. A future version of this document will define the semantics of SCXML in greater detail. 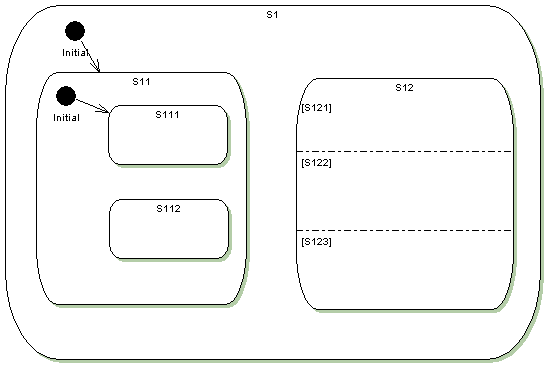 Diagram 1 shows a simple state machine with three states S1, S2, and S3. These states linked by transitions, which are triggered by events. In this example State S1 transitions to state S2 when the event Event1 occurs. This is the only way the system can move from S1 to S2, since it is the only transition between those two states. Any other events that occur while the system is in S1 will therefore be ignored. The logic in S2 is slightly more complex. It has two transitions, both triggered by event Event2. Both transitions have guard conditions that check the value of the variable X. If X < 0, S2 will transition to S3 when Event2 occurs. If X > 0, it will transition back to S2. Note that there is no condition covering the case where X = 0. Therefore the system will remain in state S2 if X = 0 when Event2 occurs. As in state S1, all events not mentioned in transitions will be ignored. OnEntry and OnExit handlers are a useful feature of Harel State Tables. They allow code to be embedded in states that will be executed whenever the state is entered or exited. In Diagram 2 we see the same three states, but now S1 has an OnEntry handler that decrements X , while S2 has an OnExit handler that also decrements X. S3 has both OnEntry and OnExit handlers, both of which increment X. Now suppose that X has a current value of 2, and that the system enters S1. When it does so, X is decremented to 1. When Event1 occurs, the system will transition to S2, as before. Now when Event2 occurs, X is equal to 1, so the system will transition back to S1. As the system exits state S2, the OnExit handler will decrement X to 0. Note that this happens after the transition is selected and the guard condition has been evaluated. X. The entry into S1 decrements X again to -1. Now if Event1 occurs again and the system returns to S2, it will transition to S3 when Event2 occurs, since X is now < 0. Leaving S2 will decrement X again, but entering S3 will increment it, so X = -1 when the system is in S3. S3 has no transitions so the system will stay in S3 forever. However if a transition is added to S3, the OnExit handler in S3 will set Y to 0 when S3 is exited. Of particular interest is the concept of a complex state, namely one that has substates. 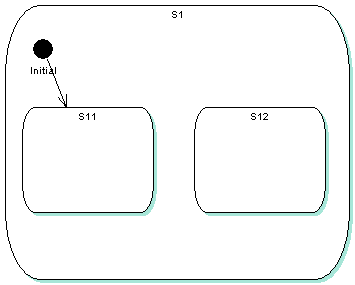 In Diagram 3 below, the State S1 now has two substates, labeled S11 and S12. In this particular case, S1 has sequential substates. When a state machine is in a state with such substates, it must also be in one and only one of the substates. The substates have a kind of "Or" semantics and can be thought of as representing a decomposition of the parent state. A transition moving the system to S1 may specify S11 or S12 as its "target" directly. However, to handle the case where it doesn't, S1 contains an <initial> element defining the default substate that it will start in if the transition simplify specifies S1 as its destination. In Diagram 3, the default substate is S11. In addition to sequential substates, Harel State Charts provide concurrent substates, which represent a form of "And" logic. When a state machine is in a state with concurrent substates it must be simultaneously in each of the concurrent child states. The concurrent child states operate independently until they all terminate (normally by reaching terminal child states) at which point the parent state also terminates. Concurrent substates thus represent fork and join logic. They are represented in our notation by the <parallel> tag. Diagram 4 below represents an elaboration of Diagram 3. First of all, State S11 has been decomposed into further sequential substates, S111 and S112, with S111 being the default initial state. Secondly, concurrent substates S121, S122, and S123 have been added to State S12. As Diagram 4 shows, the notion of complex state is fully recursive, so that the child states of a complex parent may themselves have sequential or concurrent children. Thus a complex state machine is not normally in a single state, but in a configuration of compatible states. Applying the rules for sequential and concurrent states recursively in Diagram 4, we see that when the machine is in S1 it must also be in S11 or S12. When the machine is in S11, it must be in S111 or S112. When the machine is in S12, on the other hand, it must simultaneously be in all three substates S121, S11 and S1123. Thus there are 3 legal configurations they machine can be in: S1 plus S11 plus S111, S1 plus S11 plus S112, and S1 plus S12 plus S121, S122, and S123. The Harel semantics for transitions is based on the notion of an underlying event queue. At any given point, the state machine is in a specific configuration of states. If there is an event in the queue, it is processed according to the given state configuration, and a transition may be triggered. The transition is then taken and it and all actions associated with it are executed before the next event in the queue is examined. Of particular interest is the way that <onexit> and <onevent> handlers interact with transitions. Suppose the machine is in state S2 (which is not shown in the diagram) and an event occurs which triggers a transition to state S112 in Diagram 4. In this case, the machine first leaves S2, executing S2's <onexit>handlers. It then executes any <actions> in the selected transitions. Then it enters S1, S11, and S112 executing their <onentry> handlers in that order. Only when all these actions have been executed will the machine check its queue for another event. Suppose that there is an event in the queue and it triggers a transition from S112 to S12. Going to S12 entails leaving both S112 and S11, so both their <onexit> handlers fire in that order, before the executable content in the transition. (Note that the <onexit> handlers fire in the reverse order of the <onentry> handlers.) Since S11 and S12 are both substates of S1, this transition does not entail leaving S1 so its <onexit> handler does not fire. After the transition's <actions>, S12's <onentry> handler will fire. Furthermore, the semantics of parallel states requires that entering S12 also involves entering each of its concurrent substates simultaneously. Therefore the <onentry> handlers for S121, S122, and S123 will all fire after the one for S12. Since entry into the parallel substates is simultaneous, however, there is no guarantee on the order in which the three substate handlers fire. Complex state configurations also interact with the selection of the transition to execute. First off, note that even a simple state may contain multiple transitions that match a given event. For example State S1 may contain two transitions, T1 which is triggered by event E1 with guard Cond1, and T2 which is also triggered by E1, but with a different guard expression Cond2. If the machine is in S2 when event E1 is taken from the queue and processed, it is possible that both Cond1 and Cond2 will evaluate to true. In this case, we will say that both T1 and T2 are enabled, but only one of them can be selected and executed. In the case of a single state, we will use document order as the tie-breaker, choosing whichever transition occurs first in the definition of S1. With complex states, the issue is more difficult. Returning to Diagram 4, suppose that we are in the complex configuration S1, S11, and S112, when event E1 is processed. It is possible that all three states, S1, S11, and S112, contain transitions that are enabled. In this case, we start in the innermost state S112. If it has an enabled transition, we select it (using document order as a tie-breaker if it has more than one.) If S112 does not contain an enabled transition, we look in S11 and then in S1. Thus the most narrowly scoped transition wins. The motivation for this choice becomes clear when we remember that sequential substates are decompositions of the parent state. Thus S112 is a refinement of S11 and S11 in turn is a refinement of S1. The innermost state thus "knows the most" about the situation so its transitions are preferred to those in outer states, which can be treated as defaults or fallbacks. In the case of concurrent substates, the event is processed by all concurrent states simultaneously and they select their transitions independently. Thus if we are in S1, S12 and parallel substates S121, S122, and S123, any event will be processed by S121, S122, and S123 simultaneously, and they may all select transitions. This makes most sense if all three states are themselves complex and the event is triggering transitions among their substates. If none of the three states handles the event, we move to S12 and then to S1. Although parallel substates run independently their operations can be coordinated by means of Join states. The Join pseudo-state is has multiple incoming transitions and one or more outgoing transition. The incoming transitions must be unconditional (i.e., they cannot have <cond> or <event> properties.) The outgoing transitions on the <join> may not have <event> triggers and at least one must lack a <cond> guard condition. Thus when the <join> pseudo-state is finally entered, there is always a transition that can be taken immediately. The <join> pseudo-state is not entered until all its incoming transitions are enabled. Thus the various threads of control wait in their current states until they are all ready to enter the <join>, at which point they all enter simultaneously and an outgoing transition is selected. Now suppose we have two parallel states, S1 and S2, with sequential substates S11, S12, S13 and S21, S22 and S23, as shown in Diagram 5. Given the basic Harel semantics S1 and S2 will function independently, so that S1 will move from S11 to S12 to S13 without regard to what S2 is doing, and vice-versa. But now suppose that we want to ensure that S2 does not transition from S22 to S23 until S1 has left S11. Diagram 6 shows how we can do this using a <join> state. We have inserted a <join> pseudo-state between S22 and S23, with a conditionless incoming transition from S22 and a conditionless outgoing transition to S23. (The <join> pseudo-state is represented as a vertical bar with multiple incoming transitions and a single outgoing transition.) Then we took the transition leaving S11 and made it branch to include the <join> state as an extra target. (In the diagram this is shown by inserting a 'fork' vertical bar, with a single incoming transition and multiple outgoing transitions. In our SCXML notation, we use multiple values in the "target" element). Now when the machine reaches S22, it will wait until the <join> state is active (and therefore ready to transition) before entering the <join> and transitioning to S23. Similarly, when S1 is ready to leave S11, it will wait until S2 reaches S22 before entering the <join> state. In either case, the effect of the <join> state is to cause S1 and S2 wait for each other and then to enter S12 and S23 simultaneously.